But how faithful are they? While we are thinking about it, the technologies change and develop. Android gadgets “know” how to determine your GPS-location, take pictures, shoot video and record conversations. But I’m far from certain that you know about the risks of such tiny electronic assistants. #1 Mobile networks are under control of the government or private companies, which are to follow legitimate demands of the government. The operator has access to the user data. It means that it’s dead easy to intercept you. #2 This is crazy, but over 82 billion Android apps were downloaded in the year of 2016. On the one hand, these apps serve to make people’s lives easier and more entertaining. But on the other hand, they require access to your data. Using such apps on your Android gadget to exchange photos, messages or video may lead to information leakage. #3 Android is the tool that helps the government to follow you, sensu stricto. GPS is the function we use regularly: to find the nearest shop or cinema, get round to the destination and so forth. It’s possible to keep on using your Android gadgets with all its magnificent apps having subscribed for the best free VPN for Android. strong resistance to malicious software. 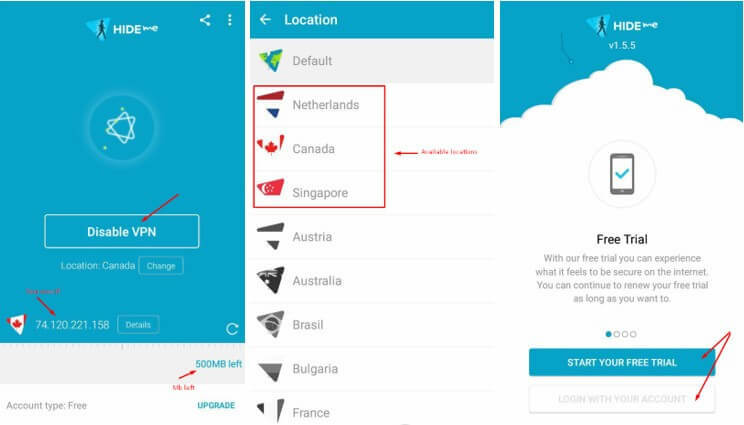 Free VPN services were created with only 1 aim – to protect Android users. They cope with the task successfully. 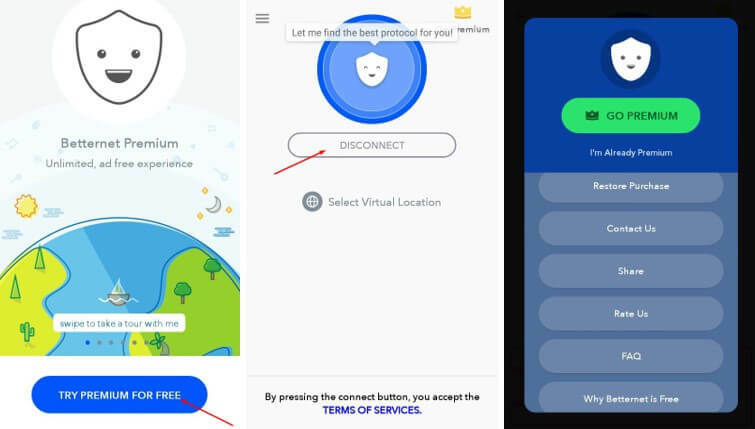 But where to find a free VPN for Android and what is better to choose? Keep on reading and you’ll get to know it! VPN or Virtual Private Network is a tool for the truly free and secure Internet. It is a network-mediator between you and the World Wide Web. VPN app is the easiest way to evaluate all the advantages of the technology. Let’s have a look at the best free VPN apps for Android. VPN Gate is free for everyone. The Japanese scientists worked out the project to help people around the world to bypass restrictions connected with the censorship. The network gained popularity in a matter of hours and is still used by thousands of people around the globe. 100% free VPN software! 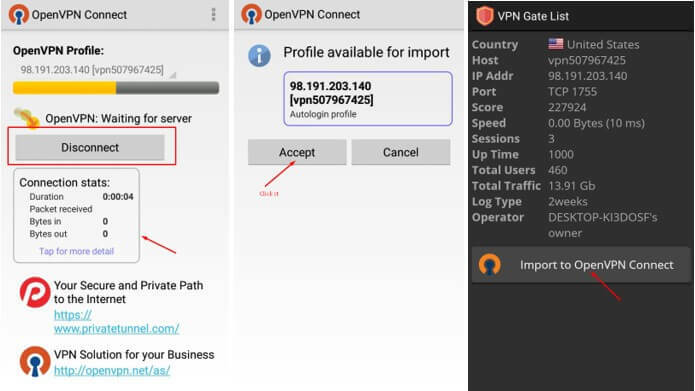 This useful Android VPN App allows surfing the Internet easily, without restrictions concerned with your location. 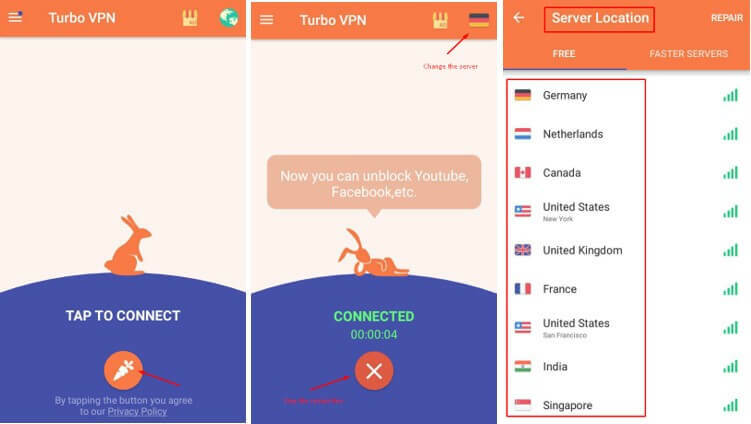 Turbo VPN interface is minimal and user-friendly. With Turbo VPN you will be protected using WiFi, 3G, 4G, LTE and other networks thanks to a reliable OpenVPN protocol. 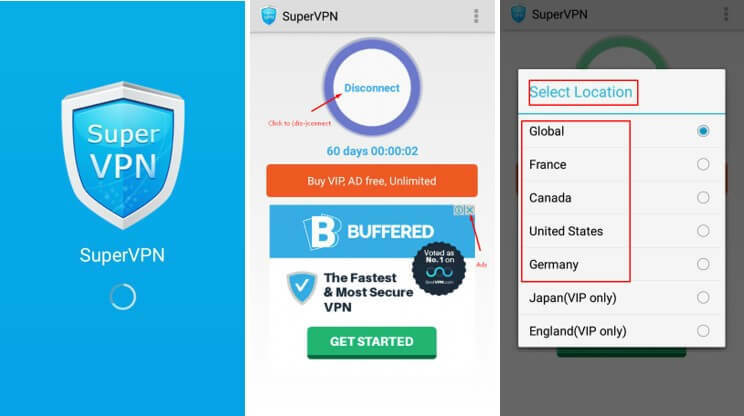 60 days of free VPN use are offered by Super VPN. Absence of registration and setup are its distinctive features. The only thing you are to do is to click the button. Another significant feature of the VPN is that the client doesn’t request access permissions from Android users. Thus, the app can’t use the data stored on your portable gadget. The VPN service is used by over 38 million people worldwide. This fact proves the idea that the service is really trustworthy. Betternet app finds a ready market among travelers, as it is a great tool for web pages unblocking. Hide Me is a VPN provider known for its high security and anonymity level. Hide Me trial allows using it without payment. It doesn’t keep logs, which is a rare phenomenon for a free VPN service. Hide Me VPN servers are located in 28 countries, but only three of them are available for free VPN account. #1 Android OS has 523 vulnerabilities, which are so alluring for hackers. #2 Android is number one target of hackers. #3 74% of Android gadgets underwent Gooligan malware in August 2016. #4 Bluetooth increases the risk of hacking attacks. #5 VPN is the best way to protect your Android device against malware and hacking attacks. Subscribe for a free VPN and protect your Android device against the prying eyes.